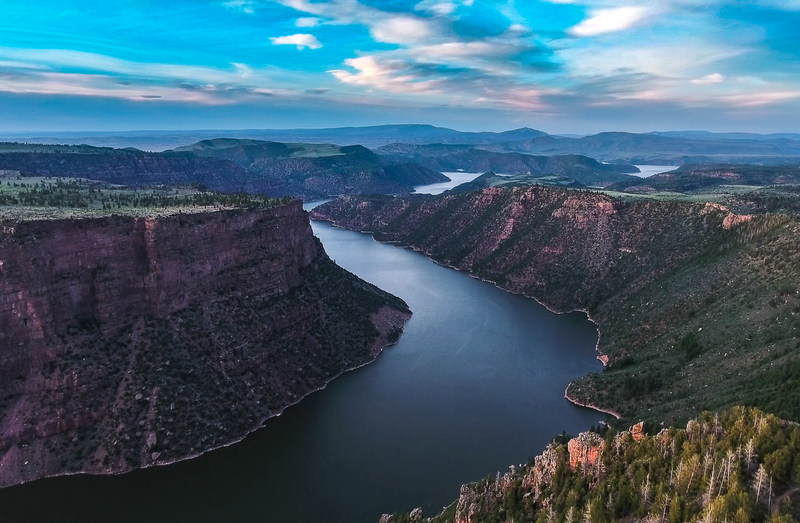 Overflowing with history, geology, and wildlife, the landscapes of Flaming Gorge National Recreation Area offer the quintessential western experience without the crowds. Flowing from the desert prairies of southwestern Wyoming the course of the reservoir meanders its way south to the subalpine terrain of northern Utah. The scenic and diverse country surrounding the reservoir’s 91-mile length is filled with awe-inspiring views. Here are four photo worthy overlooks you won’t want to miss during your next trip to Flaming Gorge. Eleven miles south of Manila, Utah on UT Hwy 44 is the Sheep Creek Bay Interpretive Overlook. This paved pullout sits nearly 500 feet above the surface of the reservoir and rewards visitors with sweeping views of Sheep Creek Bay, a great launching point for water activities. During his historic Green River and Colorado River expedition in 1869, John Wesley Powell and crew named the area after witnessing the sun reflecting off the brilliant red hues of the sandstone cliffs towering above the Green River. Today visitors can witness the same spectacle by making a stop to the overlook during sunrise or sunset year-round. Found at the end of an improved road, Dowd Mountain features a less-frequented viewpoint that will certainly impress visitors. The turn-off to USFS road #094 is approximately 12 miles south of Manila on UT Hwy 44. Follow the well-maintained gravel road for eight miles to its end. This quiet overlook delivers expansive views that fall from the Uinta mountain foothills into the high desert plains of Wyoming. Equipped with picnic tables and restrooms, Down Mountain makes a great lunch spot. The area also offers dispersed, primitive camping along with hiking and fantastic mountain biking trails. Flaming Gorge locals highly recommend enjoying sunset from Dowd Mountain during the warmer months. Red Canyon is a narrow and deep valley located at the southern end of the reservoir. Over the course of many millennia the flowing water of the Green River has sculpted this dramatic setting where one can witness the vivid contrast of red rock, green foliage and blue waters. Before soaking up the breathtaking views, guests can take advantage of the information and friendly staff at the newly remodeled Red Canyon Visitor Center. Inside you may learn more about the history, geology and ecology of the region—and experience the view window that is located at the cliff’s edge. From the overlook you may spot bighorn sheep browsing in the deep red cliffs of the canyon. Hiking and biking trails are also found near the center leading along the canyon rim beneath the shade of towering ponderosa pines. The Red Canyon Lodge, which provides dining, lodging, fishing and horseback rides, is nearby. Twenty-four miles south of Manila off of UT Hwy 44, you’ll find the Red Canyon Overlook and Visitor Center at the end of Red Canyon Road. Witnessing sunrise or sunset 1,400 feet above the cobalt waters of the Flaming Gorge Lake is beyond words. The Flaming Gorge Dam, completed in 1964, not only provides water regulation of the Green River and hydroelectricity to nearby communities, but has also shaped the outdoor playground that the Flaming Gorge National Recreation Area is known for. This impressive 500-foot-tall concrete dam is located near the town of Dutch John and offers free daily tours to the public during the summer months. After taking a look at the inner workings of the dam, be sure to breathe in the vistas outside. By driving a short way to another overlook at the top of the Spillway Access Road, visitors can enjoy the view of the massive dam face and gaze south taking in the scope of the blue ribbon waters of the Green River as it flows through the canyon. A quick drive down to the river parking area and you can take advantage of the Little Hole National Scenic Trail for some easy hiking or fishing. To the north of the dam, you’ll witness all manner of watersports enthusiasts and anglers trolling the deepest part of the reservoir in hopes of hooking a trophy fish. (Fish weighing more than 50 pounds have been caught in the fertile waters of Flaming Gorge.) While at the Dam Visitor Center, the short walk down to the Dam Point Fishing Pier is highly recommended and if you happen to have your fishing gear along you should try hooking a rainbow trout. 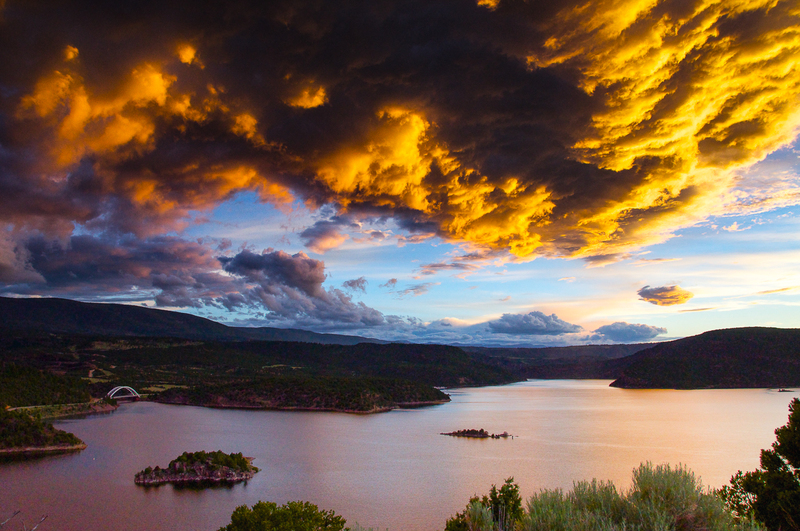 The extra time spent enjoying the golden hours at each of these viewpoints will reveal just how enchanting Flaming Gorge National Recreation Area truly is. So pack extra memory cards and double check that your camera batteries are charged and get out there. Thank you for visiting http://www.flaminggorgecountry.com/amazing-overlooks! Be sure and revisit flaminggorgecountry.com frequently for content updates and more.